Bryanna Clark Grogan’s Vegan Feast Kitchen/ 21st Century Table: REVIEW OF A HANDSOME NEW TOFU PRESS (LARGER CAPACITY; HANDMADE)-- AND A CHANCE TO WIN ONE! REVIEW OF A HANDSOME NEW TOFU PRESS (LARGER CAPACITY; HANDMADE)-- AND A CHANCE TO WIN ONE! The draw is over and the lucky winner is Courtney! 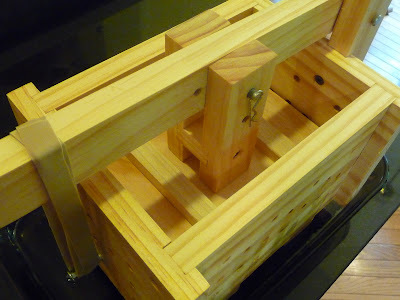 NOTE: See the end of this post to learn how you can enter a drawing for a free give away of one of these tofu presses. I have finally found a tofu press that I LOVE!! I have been making my own tofu since sometime around the late 1990’s or early 2000 (pure guess actually ... trying to find a date on some of my photos without success). 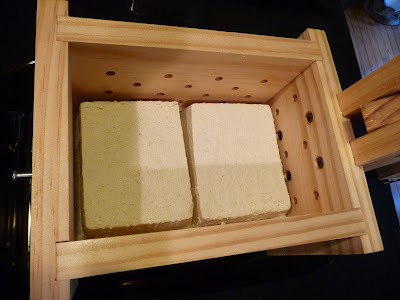 When I first got ready to make homemade tofu, I bought a tofu kit from Sanlink, and have been using that pressing box ever since. First ... for the first 10 minutes or so of pressing, I have to be "hands on", holding the two ten pound weights sitting atop the can of tomatoes all of which is providing the weight to press the tofu. During the initial few minutes of pressing, as the tofu is being pressed, it is so soft and wobbly that this stack of weights and canned goods literally weaves all over the place. Even once the tofu gets firm enough to end the "wobbling", I still keep a close eye on things to prevent 20 pounds of weights from crashing onto my wood floor. The second short coming is the size ... the box is only large enough to make a 1 to 1 1/4 pound (450 grams to 560 grams) block of tofu at a time. For as much tofu as I make, I'd like the option of making 2 pounds or more while I'm at it. (A check of the Sanlink page shows their box is now larger --- 7.5" by 5.5" by 4" deep. The one I'm using is 5.25" by 4" by 3" deep). Due to the small size of the box (5.25" by 4" opening), I've got to spoon 6 QUARTS of hot soymilk into this little container. I've done this via 2 cup scoop. I was pleasantly surprised to be contacted by Kevin Kuhns who, after learning to make tofu, realized these were problems needing a solution. He has developed a mechanical tofu press for small-scale tofu production for commercial and home use. He kindly sent me 2 units to use and evaluate in exchange for a review on this website. Kevin provided only the 2 products .. the review that follows is totally my own and is based purely on my experience with the product. His units are made from select, eastern white pine. He chose this because it is native to the US Northeast, readily available in high quality lumber, and is about as rot-resistant as the over-touted Japanese cypress. He ruled out using any of the tropical hardwoods (teak or ebony) as a matter of conscience. One of the tenets of his company is "Earth First", and his first priority was to use a sustainable wood. He makes an unfinished unit, and one finished with a food safe finish, and he sent me one of each. The only difference is that with the unfinished one, before using, you would want apply a thin coating of food grade mineral oil to the wood before using. I simply cannot say enough about how useful and practical this product is. It perfectly solves the two issues mentioned above ... I found his method of pressing to be so simple and so intuitive, it makes me wonder why no one else has thought of this as yet. The pressing is done via a handle pressing down on a top plate that is in contact with the top of the muslin wrapped tofu. 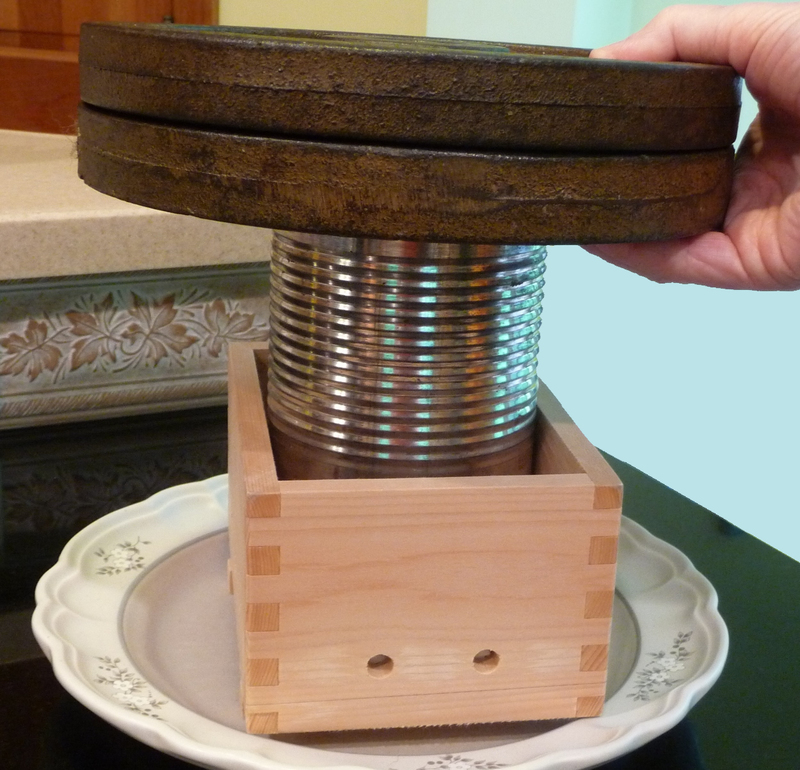 This handle is held in place with two "press bands" --- basically two wide, super-strong, heavy duty rubber bands. These bands can apply as much as 20 pounds of weight to the tofu, or as little as 5 pounds, based on whether you use one or two bands, and how much you stretch them (the amount of stretch is controlled by where you put the lower pin to which the rubber band(s) attach. This pin can be moved up or down). The beauty of this is that you pour the curds and whey into the muslin lined box, fold the muslin over the curds, apply the top plate, attach the bands and walk away. No teetering tower of 20 pounds of your husband's weights on top of a can of tomatoes to guard against toppling and falling! Kevin's box is also plenty large ... he says it will make up to nearly 4 pounds of tofu at one time. I have used it to make up to 2 pounds at one time, something I was never able to do before. Another advantage of the size of his box is that you don't have to ladle 6 quarts of curds and whey into a tiny container (as mentioned above). I just pour all the curds and whey right into this muslin lined box without a bit of problem. The box also is able to handle a "regular" batch of tofu .... 5 1/2 quarts of Soymilk to make one pound of extra firm tofu. 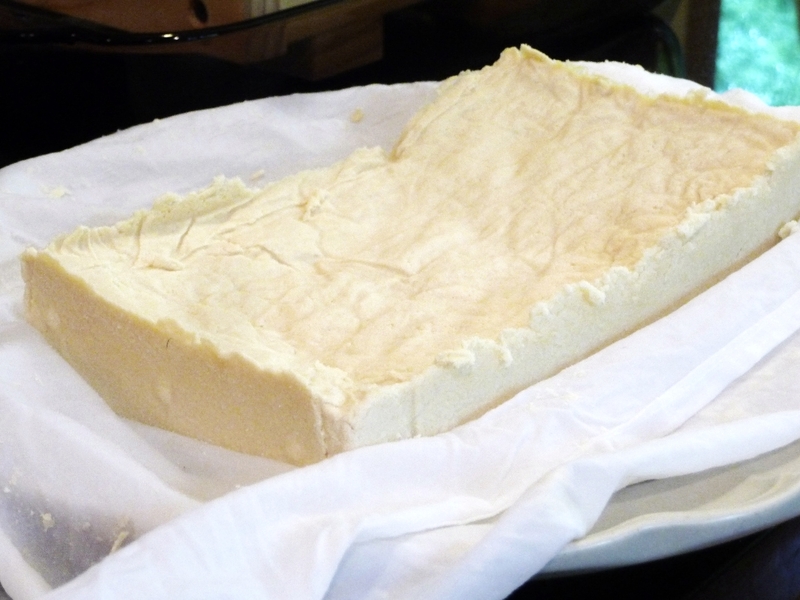 Here is my one pound block of tofu made in Kevin's Tofu Press. 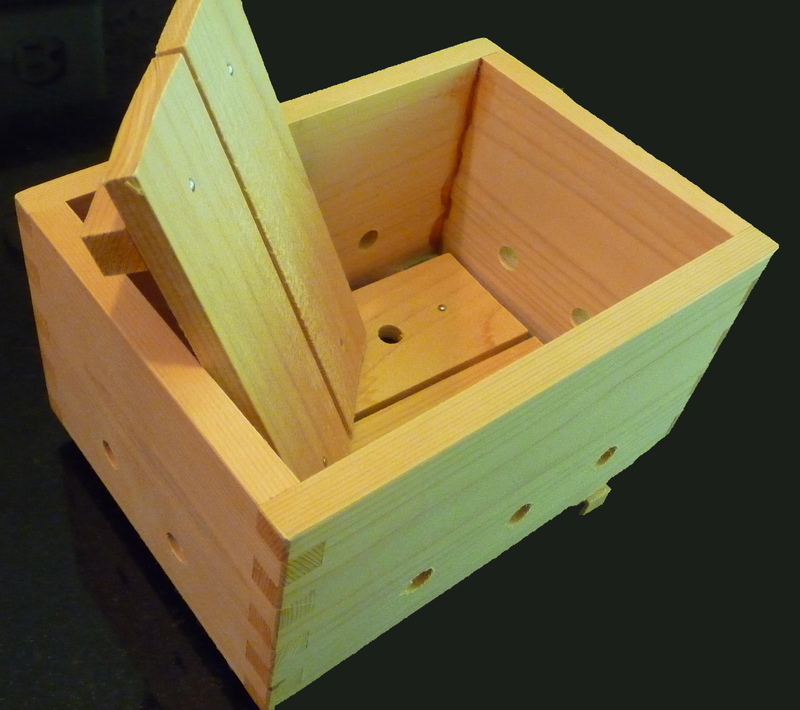 Kevin also designed the box to act as a press to press water out of commercial tofu. I tried this (yes, I do occasionally buy commercial tofu when I don't have time to make my own !! ) and his product works great! It is perfectly sized and shaped to allow two 14 to 16 ounce blocks of tofu (the size normally sold in the US) to lie side by side on the bottom plate within the box. Using his press, I was able to press out 11 ounces of water from 2 store bought blocks of tofu. He also says it will work well as a general food press, when you need to, for example, press water from thawed, frozen spinach, spring vegetables, etc. Besides the tofu pressing box itself, Kevin also includes an amply sized piece of muslin, and 3 ounces of nigari flakes, enough to coagulate approximately 10 pounds of dry soybeans. He sells the units with the food-safe finish for $46.99; the natural pine ones (no finish) are sold for $39.99. Shipping is additional, based on your location and preferred shipping method. He ships world-wide. All these units have been handmade by Kevin, and they are fine, well made products. In fact, the thickness of the wood sides and pressing plates is almost twice the thickness of my old Sanlink product. I urge you to take a look at Kevin's product ... it's always great to find something made to meet a specific need ... form and function perfectly meshing. From my uses, I can whole heartedly recommend this!! More pictures here (link: http://www.brendajwiley.com/tofu_press.html). About that contest: Kevin is generously offering to provide one lucky winner with a tofu press of their choice (either one with a food-safe finish or one of the plain, unfinished ones) free of charge. If you are interested in winning an Earth First Tofu Press, please leave a comment below. Please be sure to provide a valid email address so we can contact you if you win. Bryanna will draw the lucky winner via a random drawing on July 31, 2012 . Brenda is a 59 year old RN, who within the last year and a half, has gradually reduced her work hours from full time, to just a few hours per month to devote more time to her passions. These passions include her husband of 32 years; two canine family members; maintaining her physical health; growing spiritually; cooking; and hiking. She especially loves to connect with folks thinking about making the switch from a meat based diet to a plant based diet, to show them the all the advantages of that way of eating, and helping them avoid some of the stumbling blocks. She has been vegetarian since 1976, following a 6 month post-college experiment to see what vegetarian eating was like. That 6 month experiment is now almost 36 years and counting!! She made the switch from vegetarian to vegan sometime in the early 80’s. Brenda very much sees clear-cut connections between her life interests: maintaining a healthy body, growing spiritually, and following a vegan lifestyle. Each supports the others. Some 10 or 12 years ago, she started making her own tofu. Her webpage has pictorial step-by-step directions for this. Bryanna graciously hosted those instructions on her own site until Brenda set up her website some years ago. Kevin is a dedicated horticulturist, mycologist and out-spoken proponent of green industry and green initiatives. He has operated his own small nursery specializing in hellebores and Japanese maples and has developed a low-cost laminar flow hood and incubation device for micropropagation applications. Kevin is also a long-time devotee of soy food products, in particular tempeh and more recently tofu. In 2010 he established a start-up company, Earth First Innovations LLC, in New Hampshire that is dedicated to low-cost tofu and tempeh production devices. In his early career, Kevin worked in the telecommunications industry where he specialized in satellite communications and television encryption for 30 years. He has three patents and numerous publications in these fields. Throughout his career Kevin has engaged in extensive international assignments. He has lived as a resident of Indonesia for 17 years, Singapore for 3 years, Viet Nam for 3 years, China for 2 years with frequent travel to Europe and Africa and throughout southeast Asia. As a result, Indonesia remains a second home to Kevin, and he has fully immersed himself in Indonesian culture, language and cuisine over the many years there. It is this immersion that has made Kevin a devoted promoter of fermented foods such as tempeh, tape and oncom. When asked, Kevin describes himself as a deeply spiritual, yet non-conformist Christian with an abiding respect for the tenets of Buddhism. He is a devoted father, husband and supportive friend to those who may choose to know him. Thank you, Brenda and Kevin! As a veg chef who married a carpenter, I am mightily impressed with the obvious workmanship of the press. It's high time, the little plastic press that I have is useless, for years I just used a colander and made round tofu, when I bothered. I admit, the Wildwood tofu we get here is pretty good. Bravo for bringing sustainable wood and sustainable food together! That tofu press looks great, even just for pressing commercial tofu. The unfinished model is the same price as the Tofu Xpress and looks much more sturdy. If I don't win the drawing I'll probably buy one for myself. Wow!! Amazing press. It is so good to see such great engineering and thought put into a tool that makes life easier. And thank you for the review. I have never made my own tofu but will drive out of my way to a place that sells freshly made tofu blocks that are still warm to the touch. my email is: mckinney maritza at gmail dot com. Keep up the good work on this blog! This looks like a mighty fine product - well thought out and well made. I'd love to have one in my kitchen. After years of thinking about making my own tofu, I can feel that this is exactly what would push me into finally doing it! Oh I would dearly love to be the winner of one of the Tofu Boxes. I am very nervous of the Tofu Express as I never got a straight answer regarding the presence of BPA in their product. I would love to be able to make my own tofu in such a beautiful piece of kitchen equipment. Maybe it will find it's way to the other coast - Nova Scotia where nary a tofu box can be found ! P.S. my Hubbie and two pugs love love tofu !! Thank you for this wonderful opportunity Bryanna !! How exciting! Thank you for the very thorough description and explanation on how to make tofu and the specifics of this press in particular. I've never tried making my own tofu, but it's something I'd love to do. I'm impressed that the press is made so beautifully. It's like a functional piece of art! Sounds appealing. I'm interested in the drawing. This looks great! I have not yet braved making my own tofu, but this piece of equipment might just be the thing I need to give it a go. I would be interested to see Kevin's tempeh making equipment, too. For those of you who THINK you might be interested in making tofu, I urge you to give it a try. I compare learning to make tofu to learning to make bread .... a few techniques to learn, and once you've got those down pat, it comes out perfect every time. In fact, tofu is A LOT less finicky than bread. I've revised the directions that are on my website over the years in response to questions sent in by folks. Homemade tofu is ridiculously inexpensive, and as is always the case with homemade foods ... the end product compares to store bought tofu about the way homemade bread compares to store bought! I've never made tofu due to all the work involved, but this press looks mighty handy, would love to try out! Wow, this press looks awesome. I would love to win one. I've been wanting to try my hand at making my own tofu and this would be the perfect way to jump right into it! Oooo, those are quite lovely! 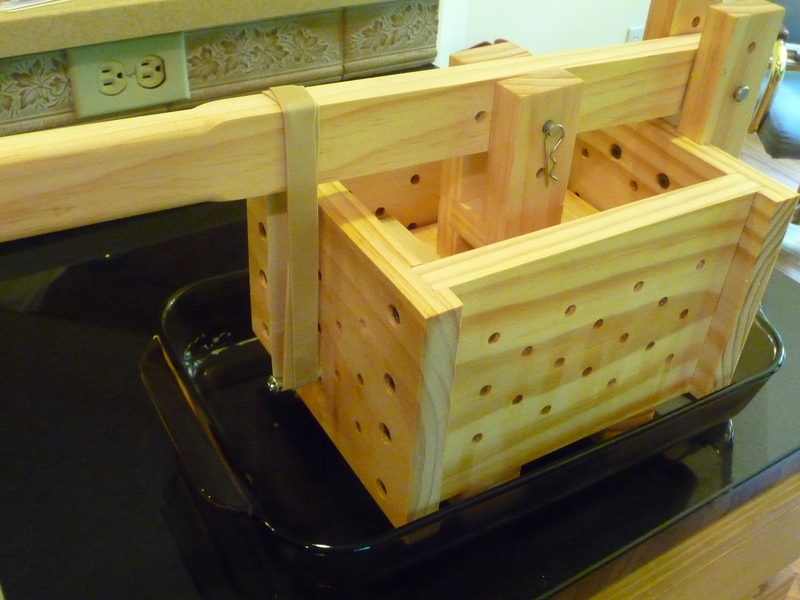 I've often considered making my own tofu and this would be the press I'd want to do it in! That tofu press looks so neat. I'd love to have one! This is a piece of beautiful art and craftsmanship. Thank you to all involved for this generous contest. That looks fantastic, please put my name in the hat for the draw! Kudos to Kevin for doing such a great job. this will probably allow me to make tofu again, it looks really great! The final frontier for me is making tofu, I've made everything else (tempeh, soy milk, breads, etc.) and it's one of the few things I still buy in the store. Would love to change that with this awesome press! My husband and I are new(5 months) vegans. Squeezing Tofu sure is a challenge. I would love to win this nifty press. But if I don't, where can I buy one in Ottawa? My husband and I are new vegans (5 months) pressing the Tofu is a challenge. I would like to win this press, but if I don't are they for sale somewhere in Ottawa? I've between wanting to make my own tofu as I'm getting into the swing of my new vegan lifestyle this would be perfect!! I'm so glad I found your blog!! Acct612@gmail.com Thank you!!! Thank you so much everyone for your kind words [I'm blushing] about my new product, the TP1201 Tofu Press Kit. Let me address a couple of questions that have come up. Yes, I will ship to the UK and most countries worldwide. I ship by the most economical option available or as directed by you. I do not stuff shipping with any other fees such as handling. I simply pass on the best shipping rate to you that I can find. Enough about me. I just want to thank Bryanna and Brenda again for helping me out here. I am truly excited about getting this product to market, and I just can't wait to ship the freebie to the winner of the lucky draw here. That's a beautiful press! I'd love to start making my own tofu (I recently started making my own soymilk, and I'm ready to embark on this adventure, too!). This looks like it would make it foolproof for even the most talented fool. I got so tired of the tiny little plastic tofu mold that I asked my Dad to make me a contraption similar to this but, like the cot he promised my first son (who's now 5), it's still on the "to do" list. Using rubber bands for the variable pressure is quite niffty. I love how this is so simple! I am always intrigued by the clever contraptions that make vegan life cheaper and easier :) Stay veg! I've been making tofu for about a year now and have a hard time eating the commercial stuff. You pretty much have to consider it a different food entirely, since it doesn't compare. As for the mold / press - I've used strainers with a flat bottom mostly, although my recent innovation is a plastic tray from strawberries with holes punched in the bottom (it already has holes in the sides). I put another tray on top and balance various jars of water, etc on top to add weight. Not bad, although I'm ready to graduate to the real deal! Thanks for offering the competition! This looks amazing. I gave up making my own tofu because of how terrible the little plastic tofu press is that I received with my Soyquick. I would definitely make my own again if I won this press!! This is genius! I've just started making tofu and I totally agree regarding the "wobblies" and weights falling off the pressed tofu. Argh! So frustrating. Thanks, Kevin, for address these concerns! This is simply genius! I just started making tofu and the wobblies (and heavy cans tumbling on the counter) is frustrating to no end. Thanks, Kevin, for addressing these concerns! I would love to try my hand at making my own tofu! This looks so much better than anything else for sale out there. Wonderful! I have always wanted to make my own tofu, partly because I like it SUPER firm. Looks like this press could take care of the tedious draining of storebought, too. Thanks! I would love to try my hand at tofu too! If it's like bread it would be a lot of fun! (I just made bread from Bryanna's World Vegan Feast cookbook--the best bread recipie ever! I have started making my own soy milk, and it's wonderful (without a machine, though). I would love to upgrade to making my own tofu as well - hopefully it's not too late to enter the contest! I can't afford the investment of a tofu press right now, so it would be great to win this contest and start paying only for soybeans and nigari. Thanks - my email is m.sqawsan.b@gmail.com. That looks wonderful! I've never tried to make tofu, but would really like to try.